The Vietnamese President has asserted that one of the priorities of his visit to Finland is to boost trade and investment between the two countries. Addressing the Vietnam-Finland Business Forum in Helsinki on May 21, President Nguyen Minh Triet noted that the two countries’ leaders are determined to raise two-way trade to US$1 billion and Finland ’s investment in Vietnam to US$1 billion in the near future. He told the forum that in Vietnam favourable conditions are well in place for Finnish entrepreneurs to facilitate their stable, productive and long term investment and partnerships. The Vietnamese leader laid emphasis on those businesses which are involved in information technology, shipbuilding, timber industry, paper making, and environmentally friendly technologies. He reminded the Finnish participants of Vietnam ’s advantages, such as its abundant human resources, an 86-million market, and the stable politics. The President also underscored the country’s willingness to work as a bridge for Finnish businesspeople to penetrate into markets of the Association of Southeast Asian Nations. He told the participants that leaders of the two countries have defined trade and investment co-operation as a priority in bilateral ties and agreed to continue boosting the ties on the basis of stability, long term, equality and mutual benefit. Upholding that spirit, President Triet called on businesses of the two countries to take the lead in stepping up trade and investment co-operation, contributing more to bolstering the Vietnam-Finland co-operative partnership. Addressing the forum, Finnish Minister of Foreign Trade and Development Paavo Vayrynen said the two countries have a high potential for boosting their economic, trade and investment ties. “An increasingly favourable investment climate in Vietnam is creating an impetus for the promotion of trade between the two countries’ business communities,” the Finnish minister stressed. He expressed hope that the two countries will soon agree and sign a free trade agreement to remove obstacles and difficulties deterring bilateral trade and investment. “Finland wants to continue to contribute to Vietnam ’s effort to realise its goal of becoming an industrialised country by 2020,” minister Vayrynen said. 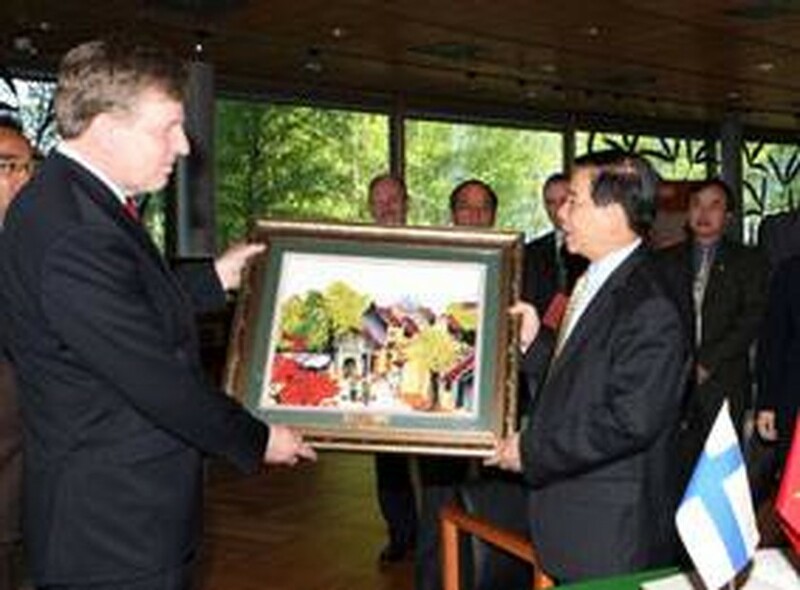 Following the forum, President Triet witnessed the signing of a memorandum of understanding on the establishment of a joint venture that will sell Vietnamese fine arts handicraft items in Finland and other European countries. Late the same day, President Triet visited a timber processing model at Stora Enso farm run by Heikki Koskimaki in Loppi city, about 70km from Helsinki. He also visited the Nokia group, the world leading group in telecommunications and information technology. Within the framework of the President’s Finland visit, Deputy Prime Minister and Foreign Minister Pham Gia Khiem held a working session with Finnish Foreign Minister Cai-Goran Alexander Stubb. Minister of Labour, War Invalids and Social Affairs Nguyen Thi Kim Ngan held a working session with Secretary of State for the Ministry of Labour Katariina Poskiparta to discuss ways and means to expand a pilot co-operative programme on migrant labourers.